In the last few years, Gujarat has been ravaged by natural calamities such as earthquake, draught, cyclone and hurricane and not so natural calamities like communal riots and financial institution failures. Under the competent leadership of Mr. Narendra Modi, the chief minister of Gujarat , various events such as symposiums, conferences and celebration of festivals like Navaratri were organized throughout Gujarat under the name of "Vibrant Gujarat" in order to revive the diamond, textile and financial industries. 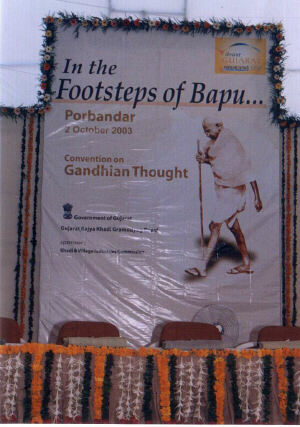 On the occasion of Gandhi Jayanti (October 2), ten-days long National Convention was organized at Porbander, the birth place of Mahatma Gandhi. 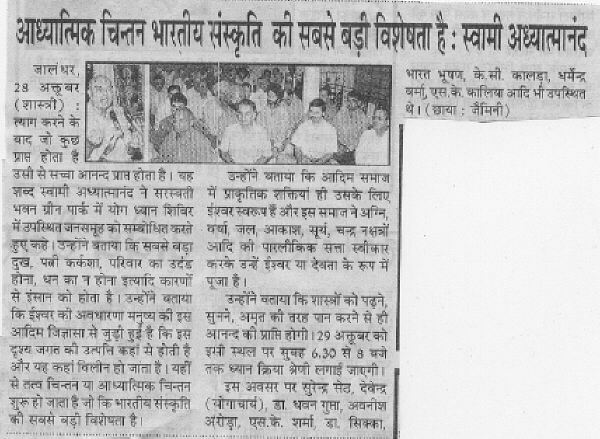 Seminar and Exhibition on environment friendly cotton (Khadi) and "Handicraft Mela" - Light and Sound show on the life of Mahatma Gandhi were arranged. Sivananda Ashram, Ahmedabad and Sri Swami Adhyatmanandaji Maharaj was specially selected and invited to organize Yoga Activities and Yoga Exhibition at the National Convention to highlight and recognize the ancient Indian cultural heritage. Sri Swami Adhyatmanandaji Maharaj along with ten other yoga teachers and yoga enthusiasts from Sivananda Ashram conducted practical teaching camp of Yoga, Meditation and Pranayama and distributed various available literatures. Dr. Snehal Amin of Sivananda Ashram and Sri Sumanbhai Desai of Sivananda Hospital , Bharuch, provided the leadership role to make the Yoga Activities and Yoga Exhibition a great success. 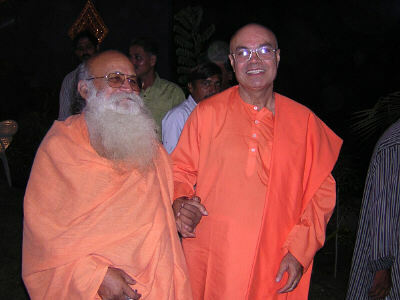 Sri Swamiji Maharaj and Sri Suman Desai were cordially invited as V.I.P. 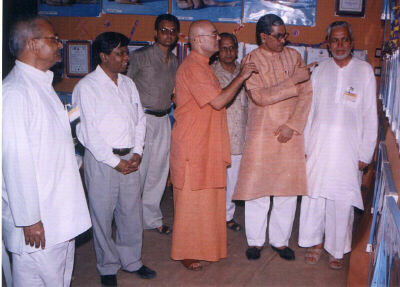 dignitaries in a daylong function at Porbandar on 2nd Oct. 2003 . During the Navratri festival (Sept 27-Oct 5), Kanya Pooja as a part of Goddess Durga worship was performed at Sri Ashta Lakshmi Bhavan. Fifty-one kanyas (young girls) were given a ritualistic holy worship with offerings of food, gift articles, utensils, money, fruits and Aarati. Maha Mandleshwar Sri Bharati Bapu of Sarkhej blessed the ashram on the concluding function of holy Navaratri celebration in the Ashram. Because of the lack of space, the ashram was unable to accommodate more than 903 candidates in Yoga Camp 600th (Sept 15 –Sept 28). A very special Yoga Camp 601 was organized from October 6-October 15 to accommodate 630 candidates who could not participate in the Yoga Camp 600. 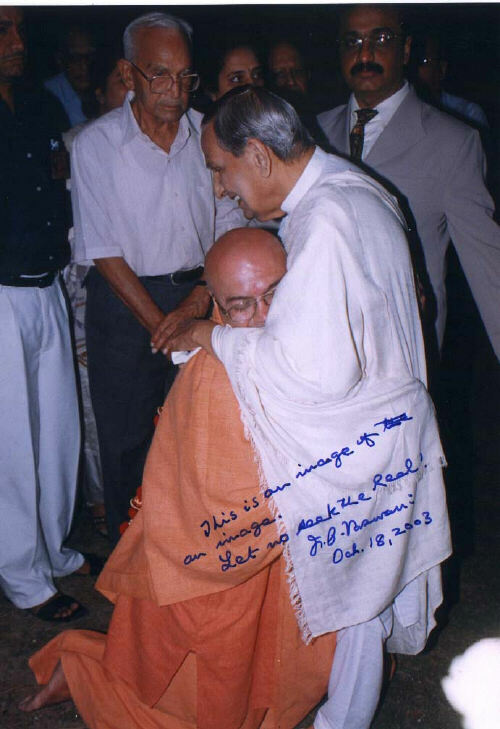 Most worshipful and Revered H. H. Sri Dada J. P. Vaswaniji’s visit to Ahmedabad was indeed like a nectar for thirsting souls. Sri Swami Adhyatmanandaji Maharaj was delighted to have his darshan and blessings. There were discourses of Rev Dada Vaswaniji at Sports club and Sardar Patel community Bhavan. 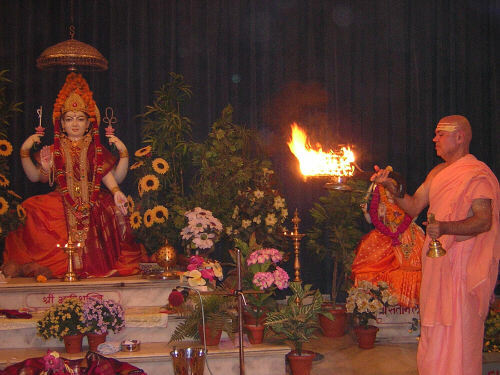 Sri Swamiji Maharaj was asked to inaugurate the Satang by lightening the lamp. Meeting of Rev. 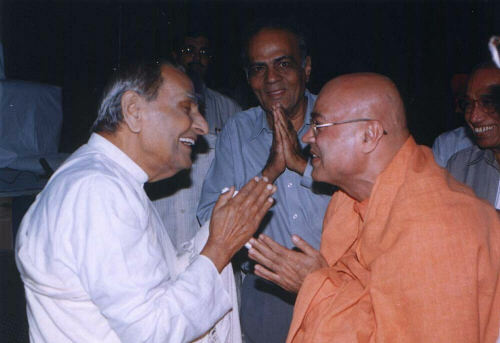 Dadaji and Rev. Swamiji was really a feast to the devotees and it was captured by the television and news media. Sri Swamiji Maharaj and devotees from the ashram were also invited by Pujya Dada J. P. Vaswaniji at the host house for special holy satsang. 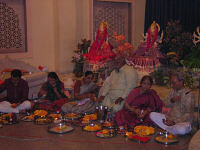 During Diwali special worship services were arranged at the Ashram. 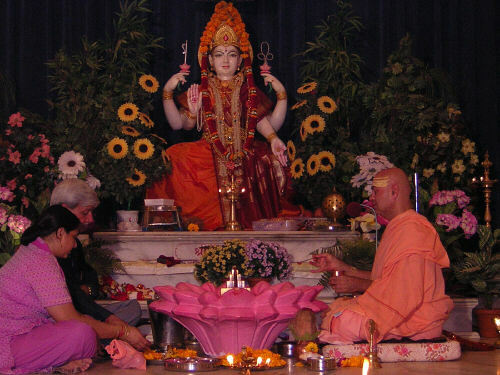 On Thursday, Oct 23 , Dhanteras day Holy Lakshmi Pooja was performed at Sri Sri Sri Ashta Lakshmi Bhavan in the evening from 5.30 pm to 9.30 pm with vedic chants and hymns that filled the entire atmosphere. A large number of couples participated in the worship. 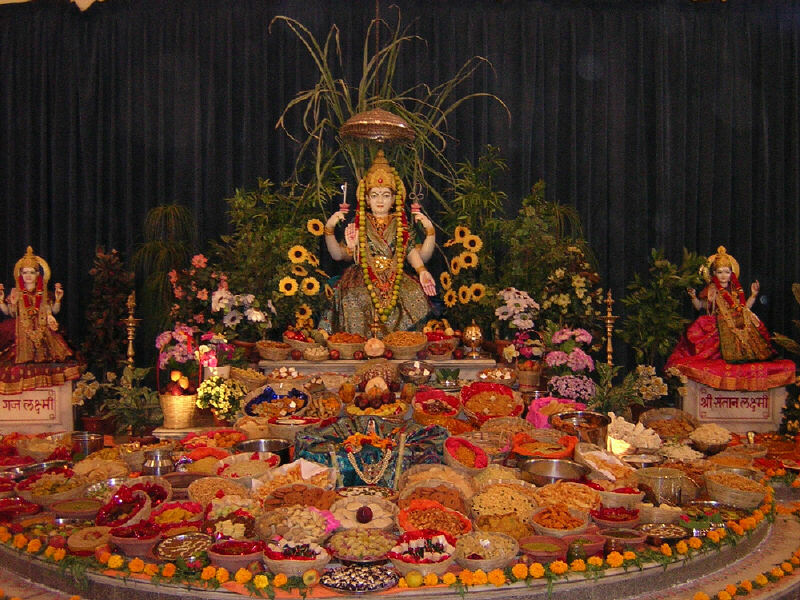 On Diwali day a grand Annakoot, offerings of many food preparations by devotees, was organized at the altar of holy mother at Sri Ashtlaxmi Bhavan. At the end of the worship all sweets and fried items were packed in 850 food packets and distributed to Daridra Narayans (Lord in the form of poor and hungry). Many devotees joyously participated in making and distribution of the food packets. This was the new year for the Ashram. The service with love to the mankind is worship to Almighty Lord Himself that was the message and mission of Rev. 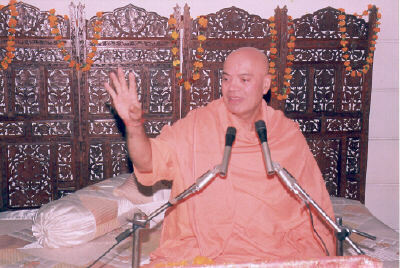 Gurudev Sri Swami Sivanandaji Maharaj. The news of Dada Pandurang Athavaleji Maharaj’s passing away came in the midst of Diwali. Rev. Sri Dada Pandurang Athavaleji Maharaj was a founder of Swadhyaya activities at the length and breadth of the world. He was honored with very prestigious Templeton award. He inspired millions of people from all the walks of life. His services towards the upliftment of the uneducated and poor will be cherished for ages and will be remembered by millions. In the prayer meeting organized at the Ashram on Sunday, 26th October, Rev. Sri Swami Adhyatmanandaji said; "Pujya Dada Pandurang Athavaleji Maharaj has not expired, he will be living and working through millions of his committed and dedicated Swadhyayis. Pujya Dada always encouraged "Sanskriti Van” cultural forest, where infinite numbers of saplings were planted and now they are giant trees. In each of these trees and forest Dada will keep on blooming for ages”...Pujya Swamiji emphasized that it is a moral duty of each Swadhyayi to keep Dada alive by following his teachings of mutual love, mutual affection and mutual harmony. A meeting was concluded with prayer for Atma Shanti and sadgati of Pujya Dadaji’s departed Soul and strength for the followers to bear this loss. Rev. 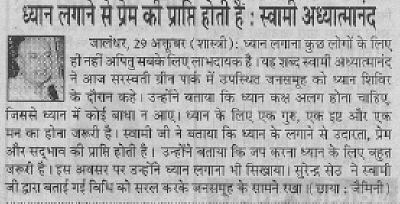 Sri Swamiji Maharaj left for programs at Jallandhar, Ludhiana , Chandigarh , Haridwar and Delhi on Oct 27 for ten days... At Jallandhar Rev Sri Swamiji Maharaj had an All India Radio interview on the subject of “Problems of Youth and Solution through Yoga of Bhagawat Gita”. 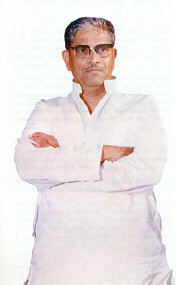 Mr.S.V.Kapil director of A.I.R. Jallandhar interviewed Rev.Swamiji. Late in the evening Rev.Swamiji Maharaja’s public discourse was organized at Saraswati Bhavan on the subject “Need of the Scriptures in present social Life”; it was organized by Rotary Governor PDG Mr. Surrender Seth. Next morning a large gathering of people attended a discourse on practical hints on the subject of ‘Meditation, its Theory and Practice”. 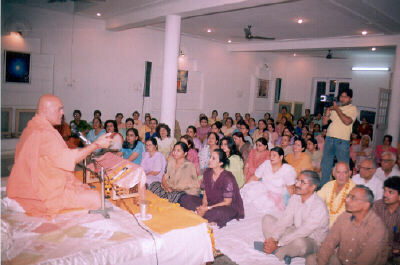 On Oct 29, 30 and 31 evening Rev Swamiji gave series of discourses at Ludhiana Jain Bhavan. Sri Swamiji Maharaj graced the holy Havanashtami (Durgashtami) Yajna, on the concluding of 13 Carores (130 millions) Mantra Japa by Smt. 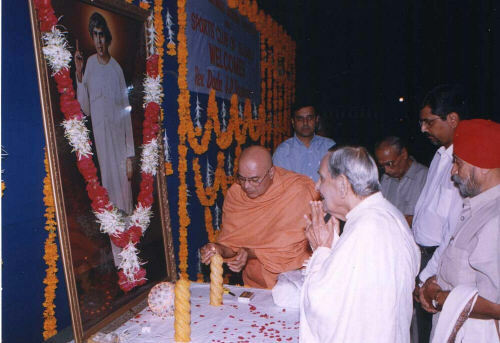 Poornaben Jyotindra Rindaniji of Jamnagar evening of Oct 3, 2003 . Pujya swamiji was invited to Sri Tapan Mankodiji’s house and Sri Satya Narayan Vrata puja was performed. Indian Oil Corporation, Sanand, Ahmedabad invited Pujya Swamiji for a “Yoga Teaching for Stress Management”. Ashram’s yoga teacher Miss Sangeeta Thawani had taken a day long yoga session to teach them relaxation through yoga. At the concluding session Rev. Swamiji Maharaj blessed all the participants and IOC Staff and gave a talk “Yoga in daily life “. Tree Plantation was carried out through the hands of Sri Swamiji Maharaj in the campus of I.O.C.